A friend and colleague of mine who went to our gig the other night took this picture of my band – Duke Rushmore — in the midst of playing The Rolling Stones’ You Can’t Always Get What You Want. The bongo player is a someone’s friend from the audience whom we invited to jam with us. It was a cool dance party that night. 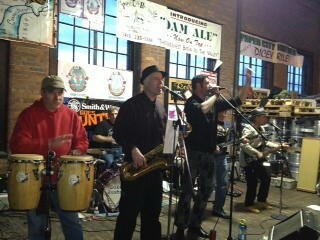 That’s me on the saxophone, singing some back up and getting ready to solo. This is for Slice of Life. 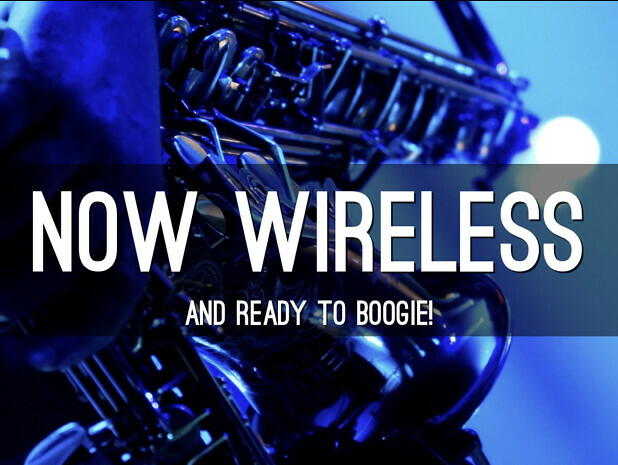 My drummer came into practice recently with some high-quality wireless microphones, and I have been practicing with one on my saxophone. This Friday, at our gig, I’ll give it a shot. I’ll no longer be tethered to the PA system. I can dance. PS — if you live in Western Massachusetts, we’re at the Holyoke Paper City Brewery on Friday night, 6-8 p.m. Entry at the door gives you free beer from the brewery and live music. 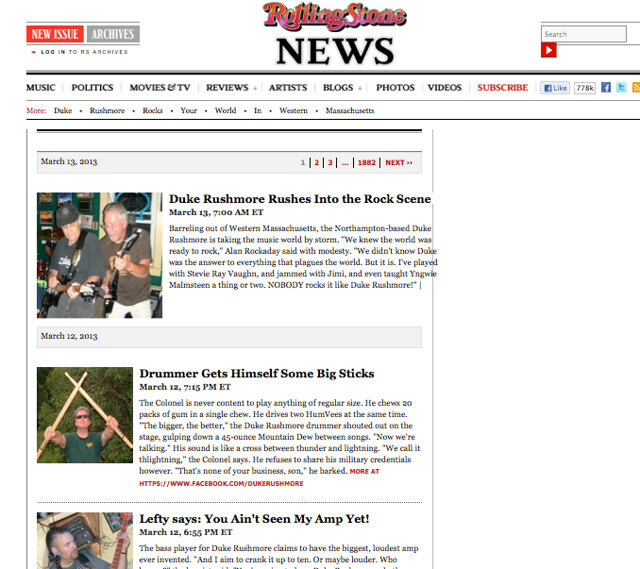 I decided to have some fun with the Hackasaurus X-Ray Goggles application, which allows you to layer in a hack on websites, by adding my band — Duke Rushmore — to the news feed page of Rolling Stone magazine (I am sure Jann Wenner won’t mind. Right?). In typical tongue and cheek, I created a series of news stories that poked fun at each of us in the band. If you knew us better, you’d get all the inside jokes. But I’d like to think the hacked Rolling Stone is still fun to read. I tried to make the writing I was doing in the form of short stories, thinking of the activity more as short story writing than information text. And let’s face it: humor writing can be difficult to pull off. Logistically, the most difficult part of the hack was the images. While X-Ray Goggles allows you to change most images, you need to have the image hosted online with a .jpeg extension. We have plenty of photos online but none that were in a format that worked for what I wanted. And we needed our own images on the site for the hack to work as I intended (as if we were really in the magazine). So, I ended up finding this site — Postimage — that hosts images, and allowed me to create thumbnails of the band. One thing that is intriguing is that anyone can remix my hack, too (as long as you have the X-Ray Goggles button on your browser) and it would be cool to have my bandmates give it a try. (I actually rehacked my original hack to add more details to the stories that came to me later in the day, so this is final is the second itteration of the hack.) I’m not sure they will take me up on the offer, although they all loved what I had done with the hacked site. Check out our hacked Rolling Stone webpage, and if you want the real news (which is not nearly as exciting), you can check out our band’s page on Facebook. I took my son and a friend to an exhibit at a local museum. The theme of the exhibit was the guitar, in all of its glory. 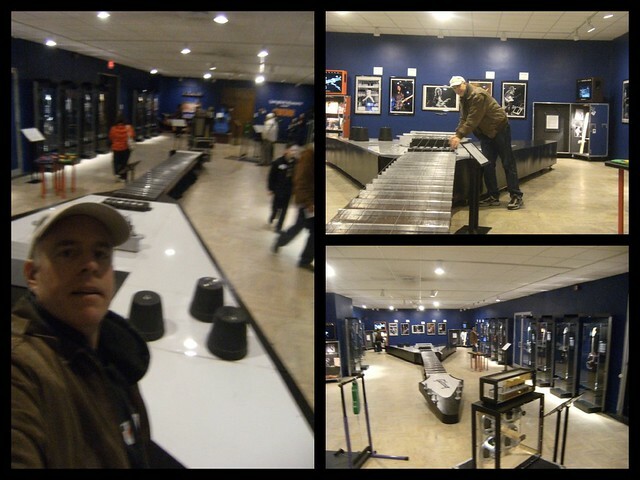 It was pretty cool — they had a bunch of famous electric guitars on display, a history of the guitar and a bunch of hands-on activities for kids. The best was “the biggest playable guitar” in the world (according to the brochure) — a 43-foot-long Gibson that you could pluck and make notes on. I won’t say it sounded all that great but that was beside the point. The guitar was HUGE! I shared the photo with my band, and then it was put on our Facebook page with a snarky comment about saxophone players needing to learn to play guitar on big instruments. My band, Duke Rushmore, is making an effort to write more of our own material. Back in the day, I used to write songs all the time for myself and for my bands, but I sort of drifted away a bit. Now, I back a bit on my guitar, tinkering around. Both our lead singer and drummer write lyrics, with no music, so I have asked them to send me their words, hoping maybe I can find a way to bring them to life. This past week, I did work on a song with lyrics from our singer, but I don’t think the tune will work with the band. But he was thrilled to have his words put to music, so that was a nice gift that I could give to him. Looking at the lyric sheet, I realized: what a mess I make of it when I work on a song. Literally. I scratch out words, rewrite phrases, put lines through whole lines and then remove the lines, draw arrows. 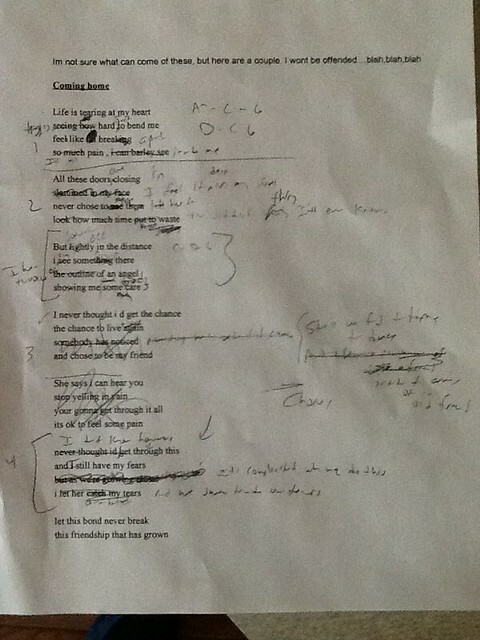 The chicken-scratch-lyric sheet is like a roadmap of ideas that can be interesting to examine. Or maybe interesting for the singer, to figure out what I was doing with his words that he graciously and courageously sent my way. You see, this kind of collaboration requires me to block out the world for a stretch and remake the writing of someone else, which can be both exciting and unsettling. It’s exciting because you are bouncing off the words of someone else. It’s unsettling because there is a lot of responsibility that comes with this kind of endeavor. Most of all, I did not want to lose the meaning of his song, even if the words were moved, deleted, changed, altered. The story had to remain true. I think I did that for him but it weighed heavily on me as I sat there with my guitar, wondering where to even begin as I looked over his words and thought about what he was trying to say. Yeah, it was a mess but it came out OK in the end. Here is a demo of the song. It’s rough and the recording didn’t come out so great because I was quickly working to get it down. I’m encouraging the guys in my band — Duke Rushmore — to come up with their own Top Five … lists for their instruments. I started with the saxophone and now our drummer has his up and running. We’ll be sharing these out at our Duke Rushmore Facebook page. A little something for my band, Duke Rushmore, as we spice up our Facebook site in-between gigs. Our bass player for my band — Duke Rushmore — put together these two videos from the first set of our gig the other night at the Paper City Brewery in Holyoke. It captures some nice energy of the stage that night, I think.